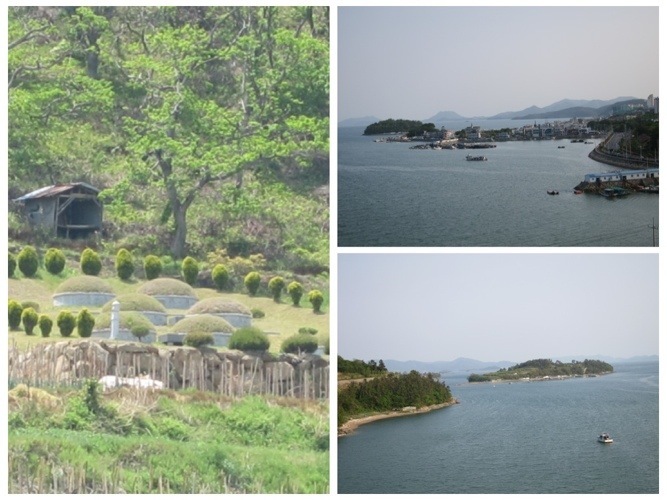 We reluctantly left Gayasan National park, heading towards the Southern coastal area of Yeosu. 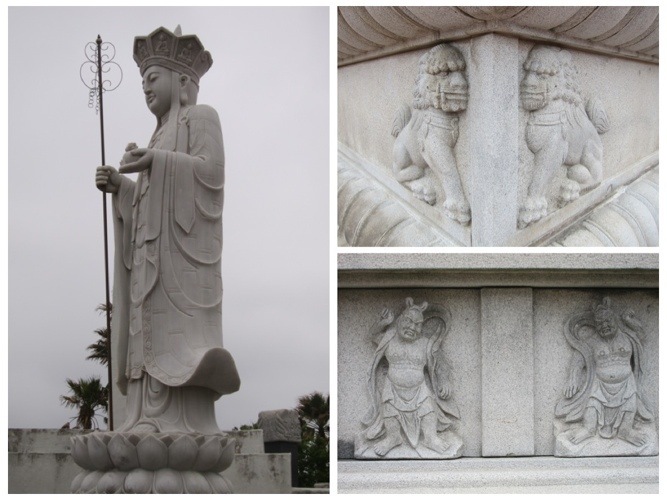 We were not eager to leave the beautiful forested mountains dotted with hermitages and serene Zen temples. I knew that the coastal area was more built up, but I did not know what to expect. 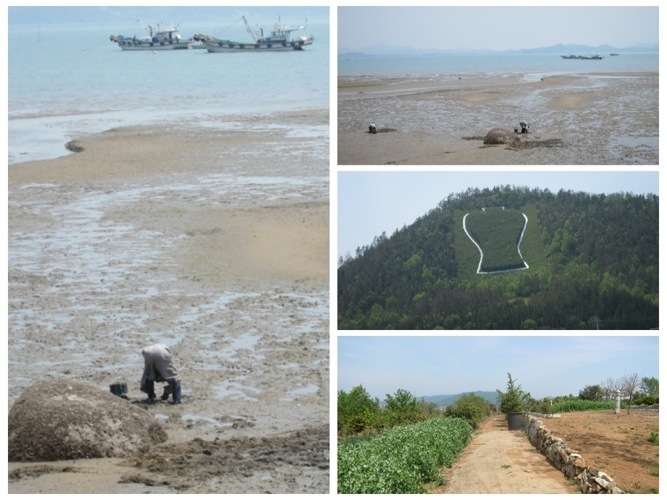 From looking at the map, I saw that the southernmost part of South Korea has many inlets and small peninsulas and that some of them are designated as ecological parks, so I imagined that it might be beautiful. Besides, I love the beach, so I consoled myself that soon we will be seeing the many little marinas and beaches, and the beach culture of South Korea. What I thought to be beaches and surfing, turned out to be full of factories and lacking in charm. There were a few small charming fishing towns along the way, with women collecting sea snails and shellfish on the shores, a small stretch of raw seafood restaurants displaying aquariums filled with fish outside the restaurants, and somewhat grimy interiors with only a wooden floor and low tables, no cushions to sit on. Before we left Gaya hotel, we went for a soak at the sauna, located at the Basement level of our hotel. Amazingly, it turned out not to be a little stuffy place, but a spacious bathing area with several hot pools with different temperatures and different mineral content, including one hot bath of Mugwort water, said to heal all sorts of ailments, a big area to shower where you sit on low stools and scrubbed yourself before entering the hot pools, a few saunas and even a barber on the men’s side, and a beauty salon on the women’s side. Jules got an excellent haircut and we both took a long and very refreshing soak and steam. My favorite was the “Pink rock salt” sauna. The rock salt was collected in the surrounding mountains, and it gave the air of the sauna a very pleasant salty feel. A friendly lady who took me into the rock sauna, tried to communicate with me, but my lack of any Korean made our conversation impossible. I still understood that she asked me where I was from, how old I was, and how many children do I have. I think I answered that I am from America and that I have fifty kids and that I have no age. She was also fifty, had two children and she looked at me with sadness in her eyes, when I said I have no children. My words could not convey to her that I was not an unfortunate woman with no children, but that I had made a conscious choice not to have children in this lifetime. A choice I have never regretted, not even once. 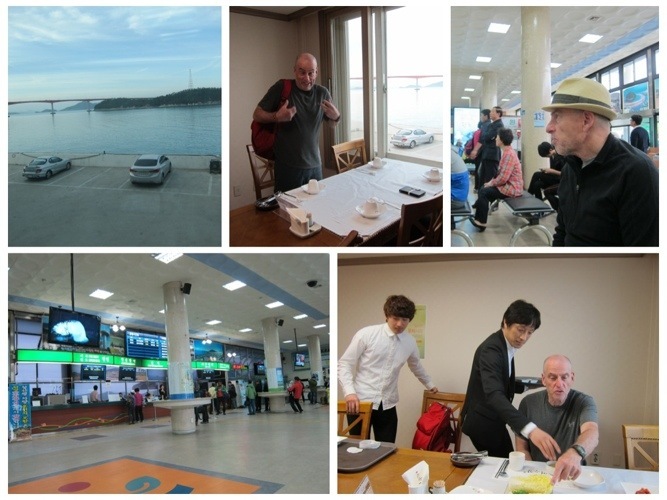 We drove to Yeosu on a mixture of highways and local roads. All along the trip we have tried to avoid the highways and take mostly small local roads, but sometimes it has not proved to be a wise or more beautiful way. The local roads often passed through charmless towns and through industrial areas, while at least on the highways, you get convenient service areas with toilets, places to buy drinks and food if you want to. In Korea, most rest areas on the highway also have one big hiking gear shop. They have some good and technologically advanced gear. To keep ourselves from being bored, we entered a few of those hiking shops, and bought ourselves hiking pants and a shirt for Jules. Yeosu did not charm us. We checked into the Benikea hotel, right on the water front and we were upgraded to a suite room with sea view. 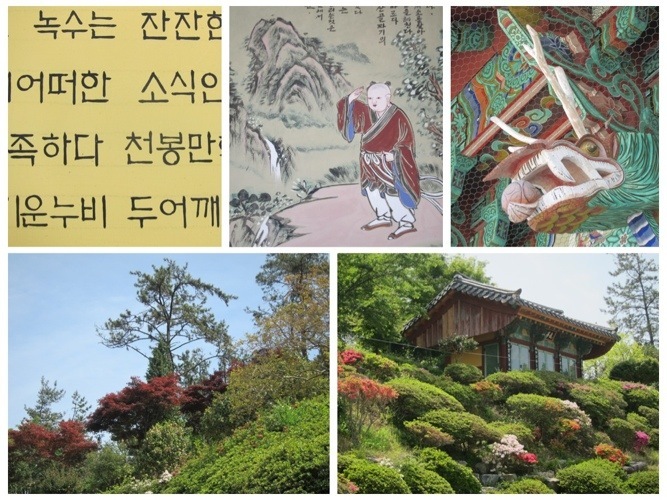 Initially we planned to spend two nights in Yeosu, and to spend the next day by going for a hike to a remote cliff top hermitage, but we did not want to spend time in a big industrial place that did not charm us at all. We told the manager that we wanted to change our plans and stay only one night. The manager said that he would have to charge us a high cancellation fee. We did not say anything, just looked at him assessing our options. After a few moments the manager suggested that he would call booking.com and see if they were willing to waive their fees for our canceled night. They did, and he was happy to inform us that we did not have to pay for the extra night. We had a forgettable dinner at a restaurant next to our hotel, of salad, king prawns and pasta, and had a good night’s sleep. In the morning, after we checked out, the manager of our hotel came over to our car and handed us two gifts – a folding bag and two coffee mugs with top strainers for dripping coffee. We were very touched by his kindness. We left Yeosu and drove towards the fishing town of Wando, where we planned to park our car and take the passenger ferry to Jeju Island. Along the way to Wando, we passed by the Boseong tea plantation area. 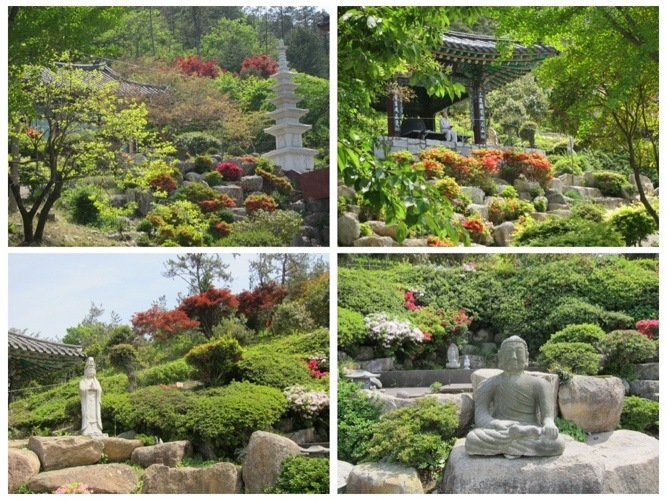 They produce forty precent of the tea drunk in Korea in this region. The terraces were green, but did not look so charming to me, after seeing Darjeeling and tea terraces in other countries. But maybe it was because the plants were trimmed for the winter and did not look so lush. Or maybe it was the renovation of the tea plantation museum, which looked like another huge and over-scale complex to explain to the many tour buses how they grow and process tea. I find that I do not even want to enter some of those monstrously large museums, that look so over-scale, with buildings that are as big as two football fields and spread onto three levels. We stopped into two fishing villages which felt more human scale, and had some charm. We still did not see any signs along this whole southernmost coast of any beach culture, surfing, beachwear, small leisure marinas…. I guess most young people prefer to live in the cities, and the older local people are too busy making a living. 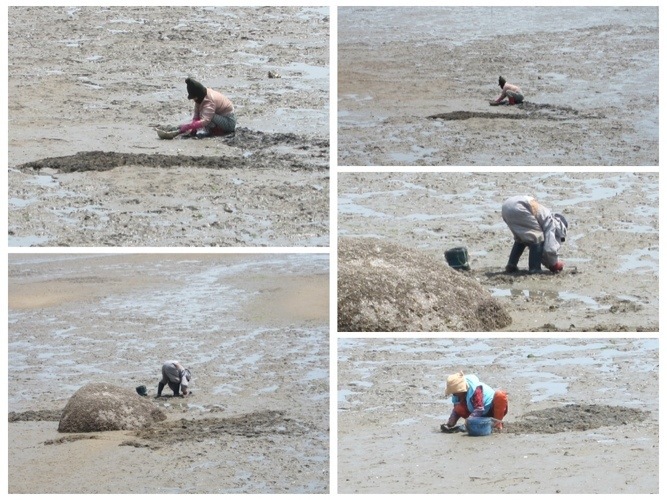 I did notice that all over Korea, you find that the people are hard working, productive and entrepreneurial. You will see no people sitting in front of their homes chatting, snacking or wasting the day away by philosophizing, and gazing at the passerby, as we saw in so many other cultures all over the world. The people in Korea go to work, and they spend all day long working. And….. on weekends….. they go in big groups to hike in one long line. Wando also turned out not to be a small place, even though it looked like an insignificant dot on the map. But it was still a big contrast to the massive public pavilions, Expo complex and huge structures that they have built in Yeosu, which looked so monstrous and over dominated the landscape. I want to make it clear that I have nothing against urban development. If they want to bring in and accommodate the masses, it is fine, but they must not find it surprising when they are not able to market themselves at the same time as a charming seaside city with appeal to the tourists. Wando is a no nonsense fishing town. It is not small, and it has a lived-in, shabby feeling to it. There is something real and authentic about it, and in its own way, it feels somewhat endearing. At the Benikea Wando hotel, we communicated with the help of the ‘Google translate’ application on my phone, and explained that we wished to park our car for the next six nights, while we take the ferry to Jeju Island. The manager was very helpful and suggested that it would be safer for us to leave our car in the hotel’s parking lot instead of parking at the ferry terminal, where there will be much more traffic coming in and out. We reserved a taxi for the next morning and repacked our bags so we can take less with us to Jeju Island. Dinner at the hotel was a nightmare. Don’t get me wrong, it was fresh…. But TOO fresh for human consumption. There was no fish, just an alarming array of all sorts of totally inedible muscly conches and abalone and things that contracted and when you touched them, and did not seem to be food at all, but something you must avoid eating at all costs. I was literally afraid to put any of them into my mouth. When the chef saw that we did not eat any of the dishes, he came to chat with us. He had spent some time in Australia, so he was able to speak a little English. After asking if we were vegetarians, he made us some salads and pumpkin dishes, a soup and some rice. We still have to pay for a seafood feast that we left untouched. A $70 meal, which is fairly pricy for this rural town, for food that we did not eat at all. We understood that unless we were starving with absolutely no other option, we should not even enter a raw seafood restaurant in Korea again. The next morning we took a taxi to the Wando ferry terminal, boarded the large fast ferry and arrived in Jeju Island after an hour and forty minutes. Most people come to Jeju island by planes, not many take the ferry, and so to get to our car rental, we had to take a taxi to the airport. Since we’d arrived a day earlier, our car rental had no cars to rent that day for our additional day. We rented a car for one day from another company, connected our English GPS which we had brought with us from the rental car that we’d left on the mainland, parked at the Wando Benikea hotel. 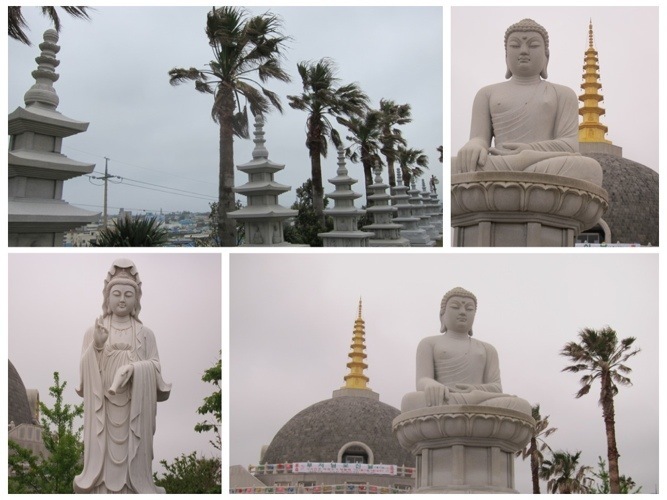 We planned to stay in three places while on Jeju Island. I know that this idea to move from place to place in the same area, might not sound wise, but after traveling the world I have learnt that unless you absolutely KNOW the place ahead of time, you will find that what had looked charming on the Internet is often far from what you find in real life. 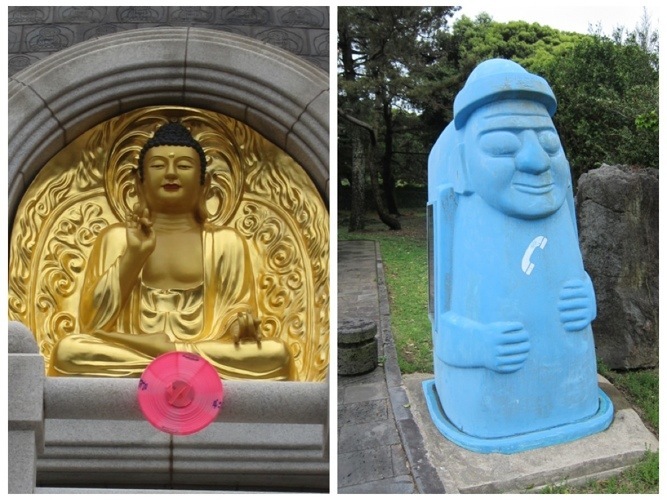 So on Jeju island we booked three places. One is a guesthouse called “Memory in Jeju,” located on the southern, more charming coast of Jeju island, where we booked a self contained villa. 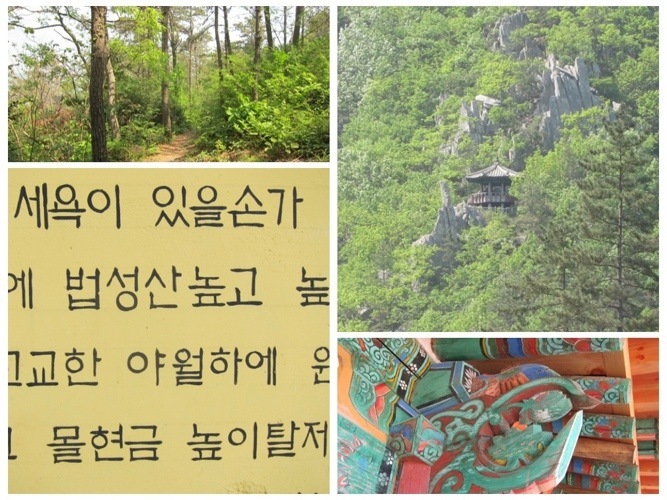 The other place is called “Kasan Tobang Hanok,” located on the edge of the Hallasan National Park, where we will stay in a Hanok room shaped like a round mushroom. The third place we booked is the expensive “Seaes Hotel” ($290 a night) where we will stay in a Korean traditional room in our own villa. Jules has a mixed vibe about this last choice, thinking it might be too full of tourists. 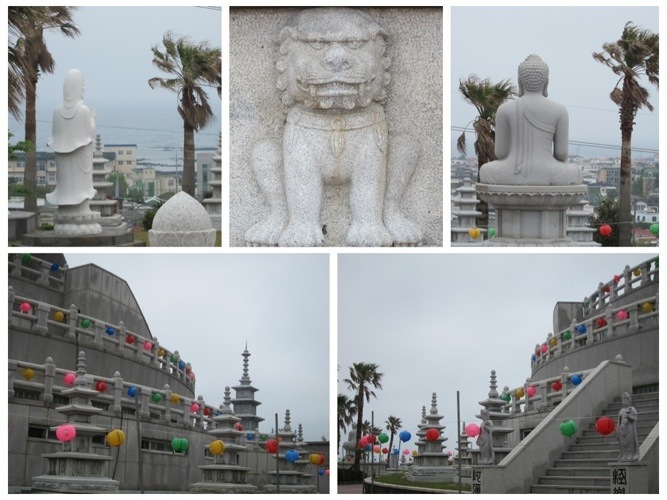 After seeing Jeju for a few days, and taking coastal drives, I would have probably made different choices, and chose some of the funky artistic modern small guesthouses that we passed by, instead of the expensive hotel. But now it is too late to change our minds without incurring a high, or full cancelation fee. 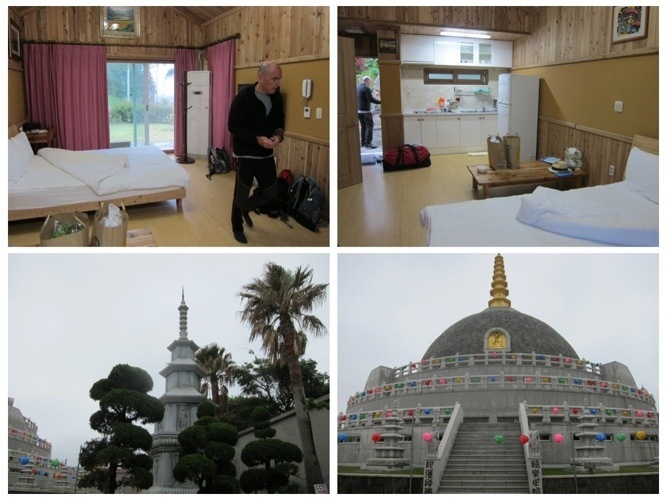 Our first guesthouse, Memory in Jeju, is much nicer than I thought it might be from looking at the photos on the Internet. We have a small villa with a kitchen, a large rainforest shower and a lovely room made from environmentally gathered fallen wood. The guesthouse is located in a charming neighborhood surrounded by citrus fruit. The most famous citrus fruit grown on Jeju island, is the Hallabong. We bought a bag of this large tangerine which is so very delicious. I guess we need the comforts of home, so instead of hoping to get some rice and vegetables in a restaurant that serves mostly meat or fish, we drove to the nearby “Emart” which is a big supermarket and a department store, (very much like a smaller Walmart, or a Warehouse, but with better food choices) and shopped for groceries. Back in our little villa we made a dinner of a big salad with lots of fresh vegetables and a simple pasta with eggplant, wild mushrooms and carrots. We also bought bagels to make sandwiches for our hiking days, and some fruit and better bakery cookies for snacks. The weekend is approaching, so instead of hiking the highest peak of Halalsan along with the masses, we decided to spend the weekend exploring other sights on this popular island, and going to hike Hallasan on a weekday. Yesterday I saw the top of Hallasan through the cloudy sky, and it looked tall and very majestic…. It seemed almost impossible that we, two little dots from a distance, will be able to climb up it….